MANUFACTURER: Dlask Arms Corporation 202B - 1546 Derwent Way Delta, British Columbia, Canada V3M6M4 Phone (604) 527-9942 Fax (604) 527-9982 E-Mail sales@dlask.com Website http://www.dlask.com DAR-701 Rifle (company literature) Features: Semi-automatic Chambered for Military 5'56x45mm and .223-Remington ammunitions (.9x19mm-Parabellum versiopn available) Accepts all standard magazines, parts, and accessories Drop-forged lower manufactured from 7075 aluminum, heat-treated to factory specifications Available as lower only. 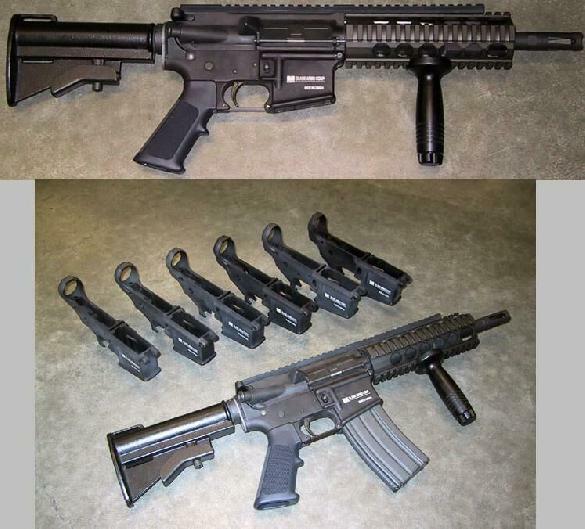 Class: Restricted (according to the Canadian Gun Laws) CONFIGURATIONS AVAILABLE: Standard M4 Configuration: M4 4-position stock Flat-top upper with Pictinny rail Standard free-floating aluminum hand guard Standard grip Your choice of 14.5" or 16" stepped barrel, or 20" HBAR Your choice of Dlask Tornado open-ended or closed-ended flash hider Cdn$1640.00 M4 with 16" barrel, Tornado open-ended flash hider, standard hand guard, 4-position stock Base price: $1640.00 Carry handle: $188.00 Detachable front sight: $65.00 Target model with 20" Kreiger barrel, standard hand guard, fixed stock Base price: $1640.00 Kreiger barrel: +$850.00 Ergo grip: +$15.00 "Mini Moose" model with 8.5" bull barrel, adjustable gas block, free-floating aluminum hand guard, full-length picatinny rail, ergonomic grip, 4-position collapsible stock. Price does not include Dlask front sight, ARMS rear sight, or magazine. Base price: $1850 Options: Various stocks, barrels, grips, rail systems, flash hiders, optics, etc. are available. Side-cocker upper available Custom laser-engraved serial number available for $25.00 Custom modifications and accessories as shown are available on special order. The DAR-701 stripped lower only is available for $288.00.